When you think of sensational action sequences and explosive setpieces, your mind may jump to big-budget productions like Uncharted or Tomb Raider. Allow me to present a dark horse contender: the unassuming Mario & Luigi series, with its goofy animations and sight gags, which has carved out its own healthy niche in the realm of visual spectacle. Take Mario & Luigi: Paper Jam, for example. One ability in the recently released RPG transforms the combat field into a squash court and plasters enemies on the back wall for prime smashing. Another technique will conjure up a large rocket, which Mario and Luigi ride, jump off, and consequently send careening into one of the plumbers, who must cling for dear life as the player guides their half-broken spaceship straight into the bad guys. Most impressive are the defensive sequences in which your party must work together to thwart enemy attacks, using careful timing to launch a boomerang at a ghost or participate in a paper airplane race with extraordinarily high stakes. Paper Jam may not have ultra-detailed textures or 1080p graphics, but it sure is fun to watch—and the QTEs are way better. For this, the fifth Mario & Luigi, the plumber pair is no longer stuck inside Bowser’s belly or plunging into Luigi’s dreams. Here they remain in the real world, joined by their parallel twin from another universe, the two-dimensional Paper Mario, who has been ousted from his home thanks to some clumsy missteps by Mario’s greener brother. Eventually, Bowser captures both Peach and her ultra-thin counterpart, and, as always, the hunt is on. There’s a desert, a forest, an icy mountain; by now you know the drill. 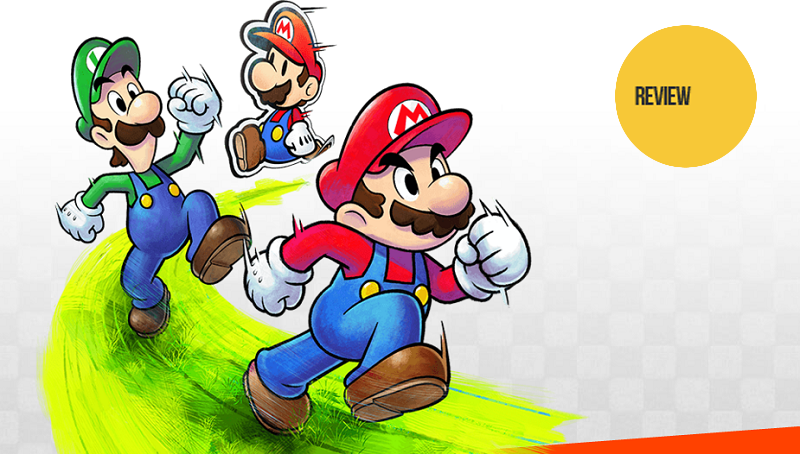 Like the other Mario & Luigi games, Paper Jam is a traditional turn-based RPG with timing-based attacks and defenses. That means if you want to make Mario’s jump attack most effective, you have to press the A button when he lands just on top of an enemy. It also means that if you don’t want to lose every battle, you have to pull off some tricky defensive moves, like hopping over Koopa shells or hitting fireballs back at your enemy with a perfectly timed hammer swing. Some of these attacks can get really complicated; the more progress you make, the more you’ll be asked to do. What’s great about this system is that it requires both mental and physical strategy. Not only do you have to make careful decisions about when to heal and when to attack, you also need the reaction skills to anticipate whether an enemy fireball will come from the top or bottom. If you don’t have the dexterity to pull off a particularly tricky move, you won’t be able to use it. Can’t figure out how to fling bombs with Luigi while simultaneously hitting them with Mario’s hammer? Use something else. Or die. Granted, you could also just switch to Easy Mode and barrel through everything, but what would be the fun there? Immediately it’s clear that the developers at AlphaDream have listened to feedback from fans and critics; the lengthy tutorials of Dream Team have been shortened, and a fast-forward button now hangs tantalizingly in the corner during every cut-scene. New ideas and abilities are introduced gradually, but every enemy feels a little different, and in ~28 hours I enjoyed almost every battle I fought. Other RPGs could learn some important lessons from Paper Jam’s timed attacks and defenses. After a few hours, Paper Jam also gives you access to a new mechanic called Battle Cards, which augment your abilities in interesting ways; one might boost power, while another might do damage to whoever on the battlefield has the most health. The game also supports the Mario, Luigi, Toad, Bowser, Peach, and Yoshi amiibo, which I haven’t had a chance to test out because I’m not an amiibo frea... connoisseur. Word is they break the game. The pace of Paper Jam is generally snappy, though it starts to slow down toward the end and eventually veers into a set of tedious distractions. The game frequently asks you to rescue kidnapped Paper Toads, which means cranking through a set of rudimentary puzzles and mini-games that are fun on their own but feel way too monotous by game’s end. Also unfortunate are the papercraft battles, a set of mini-games in which Mario and crew commandeer a giant cardboard figure (Mario, Yoshi, etc.) and use it to battle paper monsters. Beating down these papercraft enemies is an exercise in repetition, as each enemy has the same weakness, so there are no real choices to be made. The concept is interesting, but in practice, it just doesn’t work. It’s also too bad that the designers and artists at AlphaDream couldn’t harness their substantial creativity to come up with some new characters or plot points. One of the reasons people look back so fondly at the likes of Super Mario RPG and Paper Mario: The Thousand Year Door is their unique stories and casts; Paper Jam, sadly, does not live up. At least the dialogue is as wonderful as always, thanks to Nintendo’s talented team of Treehouse translators and editors. In true Nintendo fashion, Paper Jam takes full advantage of the paper gimmick to deliver all sorts of gags, puzzles, and clever one-liners. Some endgame woes aside, Mario & Luigi: Paper Jam is a delight, and worth playing even solely for the combat. What could be more satisfying than using Paper Mario to transform your enemy into a giant kite, which your trio can then fly to enormous heights just so they can then smash it back to the ground? This fifth Mario & Luigi could have done without much of the padding, but it’s almost always a blast to play. Even if it has no respect for Luigi.